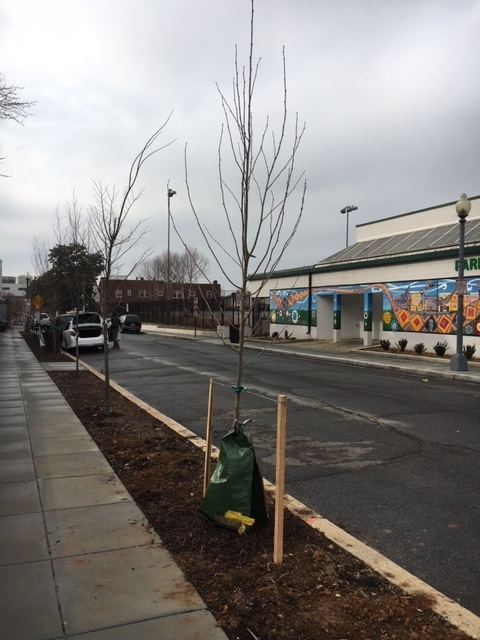 New Trees Pop Up as Part of Annual DDOT Tree Planting | Park View, D.C.
One of two replacement trees on Otis Place. As someone very interested in maintaining and increasing the neighborhoods tree canopy, I like this time of year when new trees are planted in our empty tree boxes. I also recognize that not all streets have tree planting areas, which is why I worked with Casey Trees last year to make trees available for residents in central Park View as part of a community tree planting. I’ll continue to look for ways to bring trees to treeless streets to help with the neighborhoods tree desert. I’ve noticed a number of new trees planted in the past weeks around the neighborhood and thought I would highlight where they are. In looking at the official 2016-2017 tree planting map (below) one can drill down to find both locations of new trees and which species of trees have been planted. In reviewing the map, I’ve also noticed that some of the new trees aren’t on the map. For instance, and oak was planted in an empty tree box in front of 610 Rock Creek Church Rd and two new trees were planted on Otis Place by the school. The Otis Place trees replace two of the eight new trees that were planted last season. Even with community efforts to water those trees last year, the two at each end didn’t make it and have been replaced. I think we’ll see better luck next year. One of the reasons why the tree planting map appears to add so few trees to our area is precisely because we’ve been so successful in reporting empty tree boxes and getting them filled in the past few years. I suspect that the map will continue to include few new trees in the near future, again because of this reason. This entry was posted on February 14, 2017 at 9:36 am and is filed under Streets and Trees. You can subscribe via RSS 2.0 feed to this post's comments.